Get a free RevitaLens Starter Kit and Lens Case at Walmart. 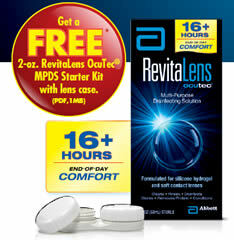 Print the offer and bring it to your Walmart Vision Center to get a free 2-oz. RevitaLens OcuTec® MPDS Starter Kit with lens case.